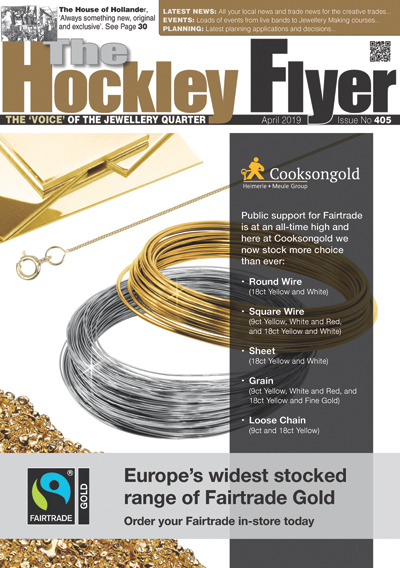 The magazine contains lots of advertisements from local companies and being in Birmingham’s Jewellery Quarter, does contain a lot of news associated with jewellery and the manufacturing associated industries. It also regularly has news from other local business’s, business profiles, technology, training & education, property, art & lifestyle, and a detailed local events section. Also the latest planning applications and decisions are published. A regular feature are the Heritage pages looking back at the ‘Good Old Days’ (and not so good!) of Hockley and the Jewellery Quarter. This A5 colour magazine is unique and was founded by Marie and Mark Haddleton 31 years ago. It was intended to be a single page ‘flyer’ but grew rapidly into a magazine. 2700 are distributed by mail and left at various pick-up points, plus the latest and over 90 back issues can also be read on-line (Click here).